1. Concrete Countertop Mix. 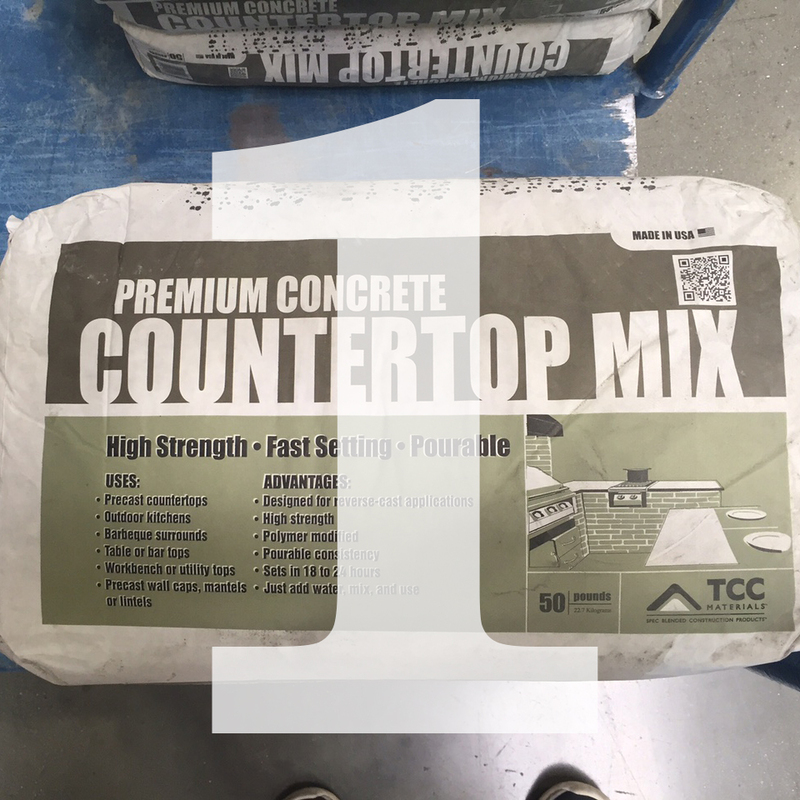 Menards is the only big box hardware store I’ve found to carry a concrete mix formulated specifically for countertops. This mix contains very fine aggregate; resulting in a smooth, even finish. Depending on the size and desired thickness of your project, there’s a chart on the back of the bag that’ll help gauge how many bags you’ll need and how much water to add. The bags are inexpensive, so I’d suggest purchasing an extra bag. Once you start mixing and pouring into the formwork, you won’t necessarily have time to run to the store if you run out. 2. Expanded metal sheet. This is required for all application, as concrete has excellent compressive strength, but very poor tensile strength. This wire mesh provides the tensile strength needed. 3. Melamine. This is what you use to create your formwork. Sheets come in ½” or ¾” thick. ½” will work, however ¾” might be easier to work with because the thicker dimension provides more surface area while attaching the sides of the formwork. When figuring out how much melamine to purchase, think about creating a negative form of the finished counter/table top. You’ll need the exact size of the top, plus the thickness in height, all the way around the base footprint. 4. Five Gallon Bucket and Mixing Bit. The bit can be attached to a drill and mixed in the bucket. Menards also sells “mixing bags” to mix by hand, similar to kneading dough, but a mixing bit and bucket will save your back and results in a much more even mix. 5. Visqueen. Used to lay underneath forms while pouring to prevent messes, but also used to cover the concrete while it’s curing. Rebar (short for reinforcing bar). This is really only necessary if the top you’re creating will have a sink or other cutout. This will be discussed in later steps. Rigid Foam Insulation. This is really only necessary if the top you’re creating will have a sink or other cutout. This will be discussed in later steps. Construction Seaming Tape. 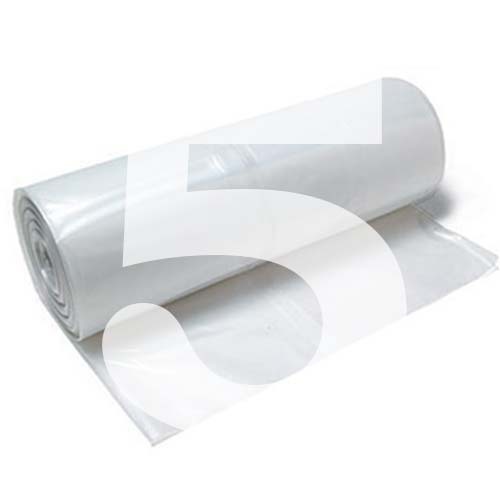 If using the rigid foam insulation, you apply this tape to the edges of the foam. This will be discussed in later steps. The first image shows the melamine cut in the exact shape/size of the finished tops. The second image shows the assembly of the formwork. As mentioned above, the sides of the forms are cut to the desired thickness of the top, plus the thickness of the melamine, and applied to the base of the form; which will actually become the top of your countertops. Typical countertop or table top thicknesses range from 1¼”-1½”. To assemble the sides of the formwork, I use a nail gun, however screws are fine. You really only need enough nails or screws to hold the sides in place and prevent the wet concrete from spilling through the seams (about every 6-12 inches apart). Remember, every nail or screw you place, you’ll have to remove once the concrete has set. You can apply caulk around the corners and seams, however this is not necessary. I actually prefer not to, as this adds an extra day of waiting for the caulk to dry and telegraphs into the finished surface. It’s important to remember these forms are mirror images of the finished countertop. The bottom layer of poured concrete is actually the top of the finished countertops. This is important in locating plumbing and sink locations in the next step. Using the template provided with your new sink, trace the outline on the rigid foam and cut this out using a jigsaw. 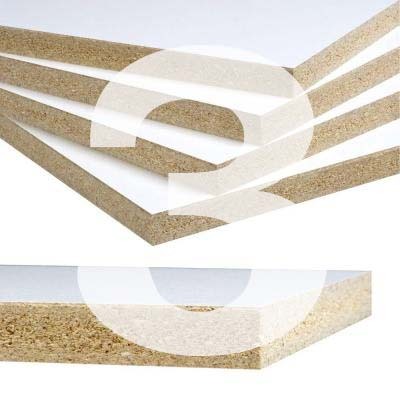 These particular countertops are 1½” thick, so the foam we purchased was 1½” thick as well. This image shows the tape applied to the sides of the cut foam. This simply prevents the concrete from sticking to foam and leaves a smooth finish once the cutouts are removed. You can also see dowel rods placed for the plumbing and sink cutouts. Also notice the visqueen placed underneath the form, prior to pouring. It’s also important to ensure the area you’ll be pouring on is level. Using the bucket and mixing bit, mix the concrete per the instructions on the back of the bag. The consistency of the mix should be similar to a milkshake or peanut butter. You don’t want it to be too watery, but it should also be able to be poured (bottom image). If the mixture doesn’t have enough water, there could be voids left in the finished product. Once about half the desired thickness is poured, place the wire mesh and rebar. Rebar is only necessary to span openings. The mesh doesn’t have to go to the edge of the form. I usually cut the mesh a few inches less on each side. It’s important to have this cut and ready ahead of time. Once you start mixing and pouring the concrete, you have to continually progress through the process until it’s complete. After the wire mesh and rebar is placed, pour the remaining thickness on top to cover the reinforcement. Once the forms are filled to the top, use a 2x4 or scrap piece of melamine to level and smooth the top of the pour. This doesn’t need to be very smooth, as this is actually the unfinished base of the countertop. This is done more to ensure an even thickness throughout the forms and fill any gaps. Once you’re satisfied the forms are filled and the thickness is even, cover the wet concrete with visqueen or plastic drop cloth. This prevents dust or debris from getting caught in the concrete, but also locks in moisture and helps the curing process. The concrete takes 28 days to fully cure, however you can take the forms off after a week or so. The mix says 18 hours, however, I air on the side of caution and wait a week. It would be a shame to exert so much energy and time, only to have your product crack/break for being too impatient. Once the form is removed, you can sand or wet polish any sharp edges. The first image shows the countertop immediately after the forms were removed. The second image is after a light sanding and shower with a hose. Depending on the application and finished appearance you prefer, there are several concrete sealers available online and at hardware stores.